Lately I have spent a lot of thoughts on building repeatable processes that can be trusted. I think that there lies the difference between being a happy hacker cracking out code for the fun of it and a happy hacker delivering something you can count on. What makes you a professional is a process that is stable, is safe, and permits you to evolve without regressions. There are many things that you could need to control to have a fully replicable environment. Sometimes you can just use some scripts to create that environment and distribute those scripts. Sometimes you can give instructions, listing all the steps to replicate that environment. The problem is that other contributors could fail to execute those steps and your whole environment could be messed up when you update something in your system. When that happen you want a button to click to return to a known working state. You can easily start having slightly different environments w.r.t. your other team members or the production environment and inconsistencies start to creep in. Moreover if you have a long setup process, it could be take a long time to you to recreate the environment on a new machine. When you need to start working on another laptop for whatever reason you want to be able to do that easily, when you want someone to start contributing to your open-source projects you want to lower the barriers. It is for all these reasons that recently I started playing with Docker. Basically you can imagine Docker as a sort of lightweight alternative to VirtualBox or other similar hypervisors. Running on a linux box, you can create different sort-of virtual-machines all using the kernel of the “real” machine. However you can fully isolate those virtual machines, installing specific versions of the tools you need, specific libraries, etc. Docker runs natively only on Linux. To use it under Mac OS-X or Windows you need to create a lightweight virtual machine running Linux and Docker will run on that virtual machine. However the whole mess can be partially hidden using boot2docker. It means some additional headaches but you can survive that, if you have to. If I can I prefer to ssh on a Linux box and run Docker there, but sometimes it is not the best solution. Let’s start with a simple example: let’s suppose you want to develop a PHP application (I am sorry…) and you want to use MySQL as your database (sorry again…). We will create two docker containers: on the first one we will install PHP, on the second one MySQL. We will make the two containers communicate and access the application from the browser on our guest machine. For simplicity we will run PhpMyAdmin instead of developing any sample application in PHP. Let’s start with something very simple: let’s configure a Docker image to run httpd under centos6. Let’s create a directory named phpmachine and create a file named Dockerfile. Note that this is a very simple example: we are not specifying a certain version of httpd to be installed. When installing some other software we could want to do that. docker build -t phpmachine . This command will create a container as described by he instructions. As first thing it will download a Centos 6 image to be used as base of this machine. Cool, it is up and running! Let’s improve the process so that 1) we can start the httpd server without having to use the console of the docker container 2) we do not have to figure out the IP of the container. In this way the port 80 of the docker container is re-mapped into the port 80 of the host machine. 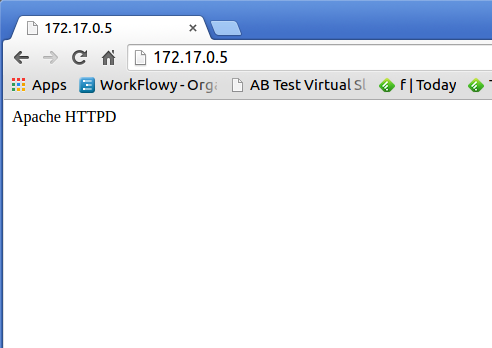 You can now open a browser and use the localhost or 127.0.0.1 address. Wonderful, now let’s get started with the MySQL server. We want to create a Dockerfile in another directory and add in the same directory a script named config_db.sh. 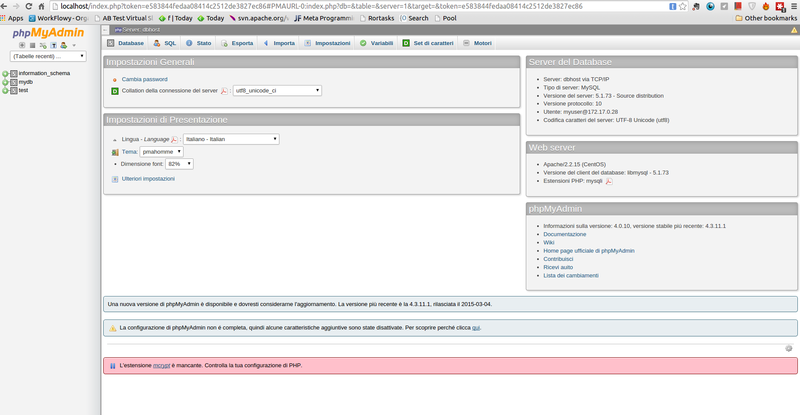 mysql -e "CREATE DATABASE mydb"
mysql -e "GRANT ALL PRIVILEGES ON mydb. * TO 'myuser'@'localhost' IDENTIFIED BY 'myuserpwd'; FLUSH PRIVILEGES;"
mysql -e "GRANT ALL PRIVILEGES ON mydb. * TO 'myuser'@'%' IDENTIFIED BY 'myuserpwd'; FLUSH PRIVILEGES;"
mysql -e "select user, host FROM mysql.user;"
Note: we are not saving in any way the data of our MySQL DB, so every time we restart the container we lose everything. docker build -t mysqlmachine . Does everything works as expected so far? Cool, let’s move on. From the console of the phpmachine you should be able to ping dbhost (the name under which the phpmachine can reach the mysql container). Good! In practice a line is added to the /etc/hosts file of the phpmachine, associating dbhost with the IP of ourmysqlmachine. This will mount the directory with the source code of PhpMyAdmin on /var/www/html in the* phpmachine*, which is the directory which Apache httpd is configured to serve. In this way the phpmachine should use the db on the mysqlmachine. Now you should be able to visit localhost and see a form.There insert the credentials for the db: myuser,myuserpwd and you should be all set! How does Docker relate with Vagrant and Ansible, Chef, Puppet? Ansible, Chef and Puppet are ways to manage the configuration of these machines (operationalising processes) they could be used in conjunction with Docker. Ansible seems much lighter compared to Chef and Puppet (but slightly less powerful). It is gaining momentum among Docker users and I plan to learn more about it. This post gives some more details about the relations between these tools. In our small example we could play with a realistic simulation of the final production setup, which we suppose composed by two machines running CentOS 6. By doing so we have figured out a few things (e.g., we have packages for MySQL 5.1 and it forces us to not use the last version of PhpMyAdmin, we know the complete list of packages we need to install, etc.). In this way we can reasonably expects very few surprised when deploying to the production environment. I strongly believe that having less surprises is extremely good. We could also just deploy the docker containers itself if we want so (I have never tried that yet).